Vinitus will not disappoint. As bold as this statement may seem, I'm confident in my declaration. Stemming from the same parent company that has several acclaimed restaurants in the city, such as Ciudad Condal and Cervecería Catalana, Vinitus follows the same quality and service mantra as its predecessors. Few places in Barcelona deliver on that promise and fewer still have eager patrons waiting in queues to be seated at their establishment on any given night. That's an indication of value and Vinitus is well on its way to achieving that distinction. 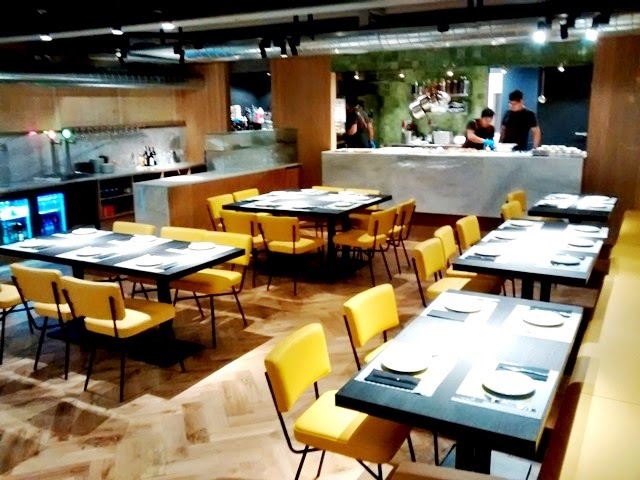 In its prior life the restaurant was found in L'illa Diagonal - a shopping complex with heavy foot traffic but away from the more touristy areas of the city. 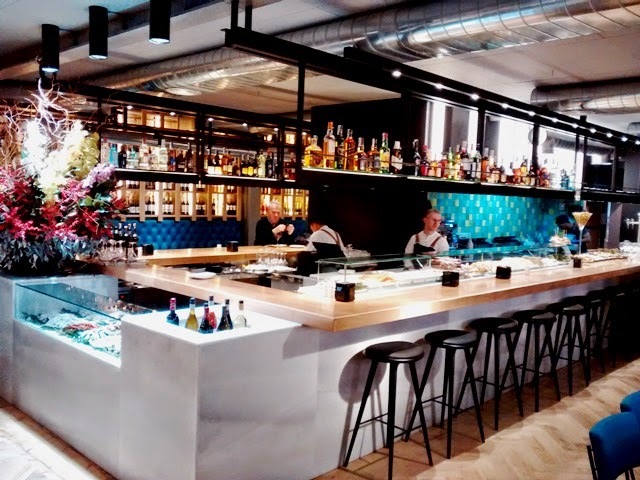 At its new premises in the Eixample district - two streets away from busy Paseo de Gracia avenue - it continues to provide the same delicious, affordable tapas in a charming and warm environment. Over an ice cold Moritz beer, I started off with a plate of Iberico ham, thinly sliced, buttery and nutty and accompanied that goodness with pan con tomate – crunchy toasted baguette rubbed over with a fresh tomatoe and adorned with a dash of garlic, olive oil and a sprinkle of rock salt. Next I moved on to the juicy grilled prawns, perfectly seared and seasoned. And lastly - one of my favorite dishes - four types of mushrooms grilled to perfection and varying in flavor, texture and color. All four were excellent. There was much more I wanted to try - and I will - but alas a stomach is only so big. its brethren restaurants, but that is rightfully so as there is a great amount of attention paid to detail as far as decor is concerned. For example, the design and shape of some seats by the door: champagne corks. Illustrations and graffiti-like images line some of the walls, and colorful tiles, polished wood and stone, and other whimsical and decorative patterns abound. This is a place certainly not to be missed and is already high on my list of favorite go-to joints. Mondays to Thursdays: 7.30 am to 12.00 am. Fridays and Saturdays: 7.30 am to 12.30 am.